Manhattan Clam ChowderMake money with our recipes! See how our recipes can help you save money based on serving sizes. We've got all the ingredients you need. Make tasty clam dips or the classic clam chowder with this ocean clam juice! Clam juice is the savory strained liquid of cooked ocean clams. It can be used as a flavorful substitute for fish stock, and it can add flavor to clam dishes like Mediterranean clam salads with onions, peppers, olives, and feta cheese. Use it to enhance a wide array of other savory seafood dishes, such as rich shellfish stews with herbs or zesty seafood paella with rice. Add a delicious hint of clams to your seafood gumbo, steamed clams, or even certain cocktail recipes with clam juice. The juice of ocean-fresh clams offers your patrons a breezy summery sense of the seashore. This clam juice makes it easy to add the robust flavor of plump clams to your hot soups, creamy sauces, and more without the time consuming prep work! 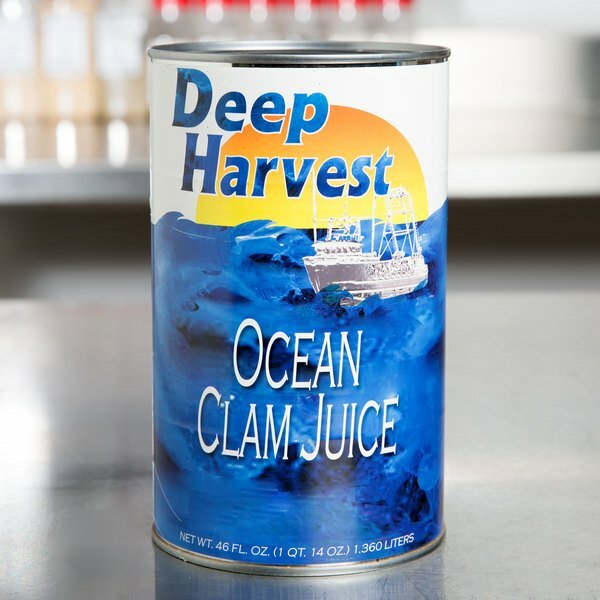 Packaged in a generously-sized can, this clam juice makes it easy to quickly and easily prepare and serve classic dishes or gourmet creations. 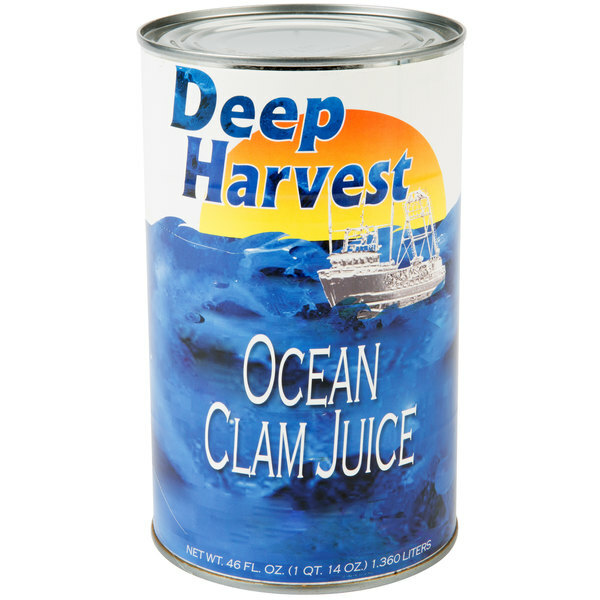 Deep Harvest Ocean Clam juice makes a delicious clam chowder. I don't know how they do it but it tastes like fresh clams. So Delicious! I purchased a case of the 46 oz Ocean clam juice for my homemade clam chowder, linguini with clam sauce, and seafood lasagna. It is an excellent value compared to the tiny overpriced local market stores. It is a staple in my pantry for home use and catering. This is very cheap and worth every penny. I am a big fan of clam juice because it adds much more complexity and flavor to a clam chowder or to any seafood dish you are preparing, especially chowders and bisques. I highly recommend it, but use it fast after opening the can or refrigerate it. I lost a few onces because I left mine outside the refrigerator for over a week. A large size and great price can of ocean clam juice. The juice has a saltiness that is great for adding to stews or savory cocktail drinks. A delicious and salty tasting ocean clam juice that is great for making our own clam and tomato juice base mixer. A great bulk price and sturdy can. Ocean Clam Juice that is perfect for making our seafood gumbo. The clam juice is salty and well seasoned. 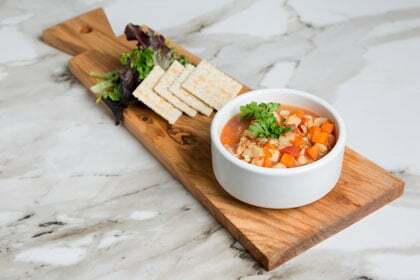 A great way to add quick flavor to your chowders and soups. 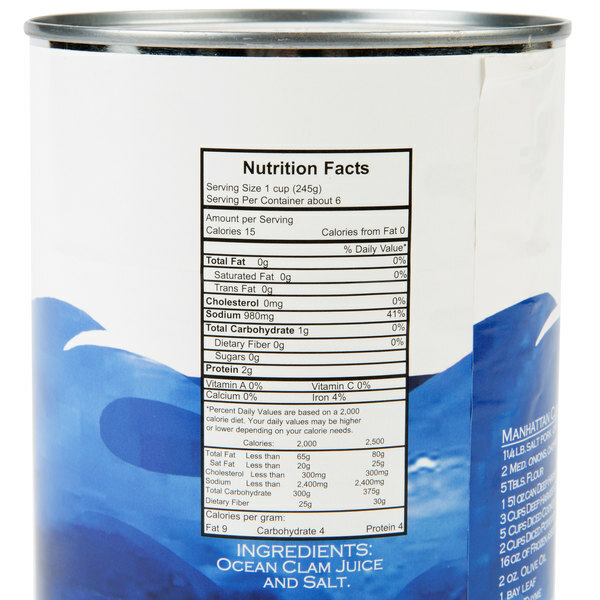 A nice salty tasting ocean clam juice that is perfect for making our clamato cocktails. The juice is a great price and perfect for our specialty drinks. I love making Bloody Marys with a splash of clam juice. The extra salty flavor is so good and helps thin out the tomato juice a bit. I love the Deep Harvest brand. If you like to make clam chowder this clam juice will make your recipe great. It is very inexpensive and if you live in a place that is not close to the ocean, like we do, you will enjoy this product. With the weather cooling off, my family loves clam chowder. I love the clam juice because it adds a great taste of my soup and its a great. I have been using it for many season and am always pleased with the results. 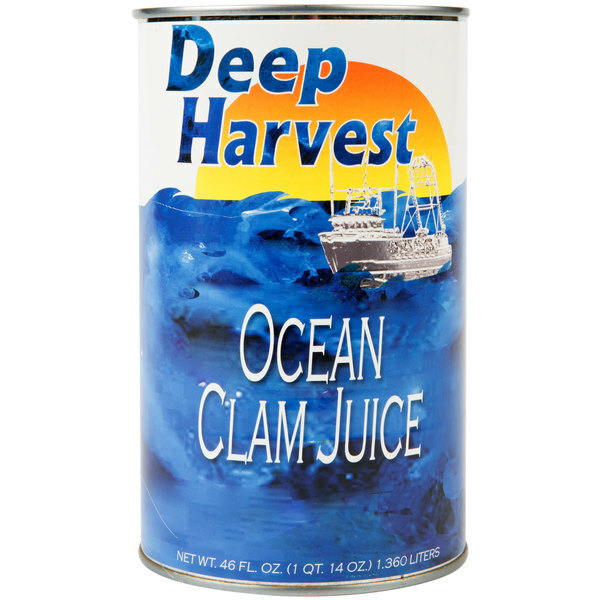 Deep Harvest's ocean clam juice is the perfect addition to making our house made clam chowder. The chowder is fall time favorite so the large can size is perfect for making large batches. 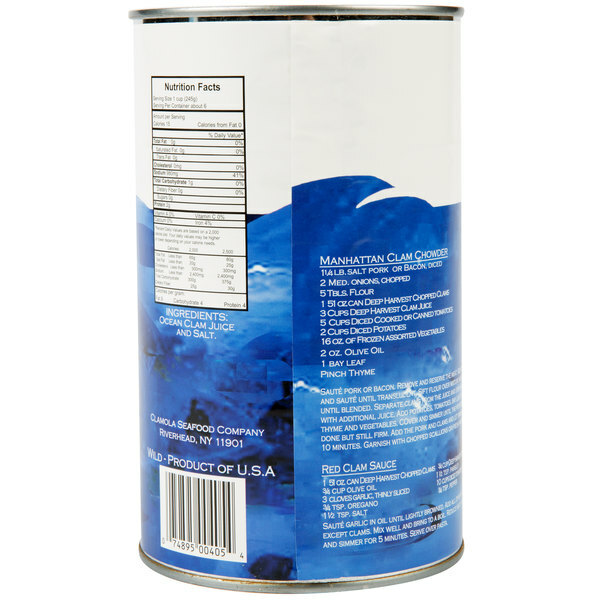 These large cans of clam juice are the key to making a delicious clam chowder. The juice is perfectly salted and the flavor is ideal. This is good to use when making clam sauce for pasta, clam chowder soup, and even in spiced tomato juices. It really adds flavor to whatever it is added. Great clam juice. It helps our clam chowder to have more flavor. We were so happy to be able to find this available in small quantities for our soups for lent. If you add this in along with your clam meat, your dish is have a wonderfult taste of clam altogether. the price is so much cheaper bought in large cans like these. Clam juice that doesnt coz as much as you see from big box superstores. Not only is it cheap, but it's double the portion. This is a great product for a great price. I love using clam juice in sauces and soups alike. Great for steamed clams and linguine and clam chowder.